Coming off a dominant 41-14 win over Oregon State last weekend, P.J. Fleck’s Minnesota Gophers will head into Saturday’s matchup against Middle Tennessee with even more swagger. They got a fresh new look. And it’s #Elite. 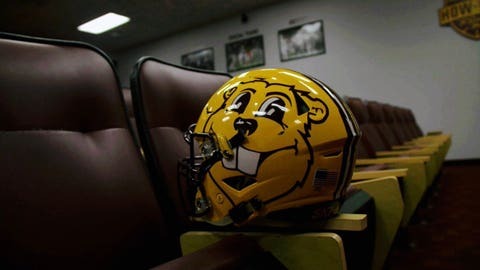 On Tuesday night, Fleck tweeted a video of his team gifting the University’s mascot, Goldy Gopher, with a birthday present: a brand new gold helmet the team will wear in its next game that features a head shot of the mascot on one side. This will be the third different helmet the Gophers have worn in three games. They began the 2017 season against Buffalo wearing a maroon helmet and topped Oregon State while wearing a new white helmet. Both featured Fleck’s “Row the Boat” slogan on a stripe down the center. Goldy has been the University’s mascot since the 1940s and has won three national mascot competitions, most recently for the 2016-17 school year.